The first teaser look of Veere Di Wedding certainly stunned Hindi film fans with the colorful poster featuring the girl gang in gorgeous lehengas. In fact, this first glimpse of the film had audiences even more eagerly waiting the unveiling of the first look of the film. Now we have that first look and it is just WOW and very intriguing! What is even cooler is that we also learned that we will get to see the film in all its finery on May 18th. This first poster is nothing less than a celebration in itself because we see the leading ladies striking their best poses, looking completely adorable in sherwanis and donning pagdis. The anticipation for a film that stars Sonam Kapoor and Kareena Kapoor Khan is high and now after seeing these first looks audiences can’t wait to attend this grand wedding! Veere Di Wedding, directed by Shashanka Ghosh, and also starring Swara Bhaskar and Shikha Talsania is still on floors and the cast and crew just successfully wrapped their Delhi schedule. Be sure to Save the date and #GetReadyForVeereDiWedding on 18th May 2018. 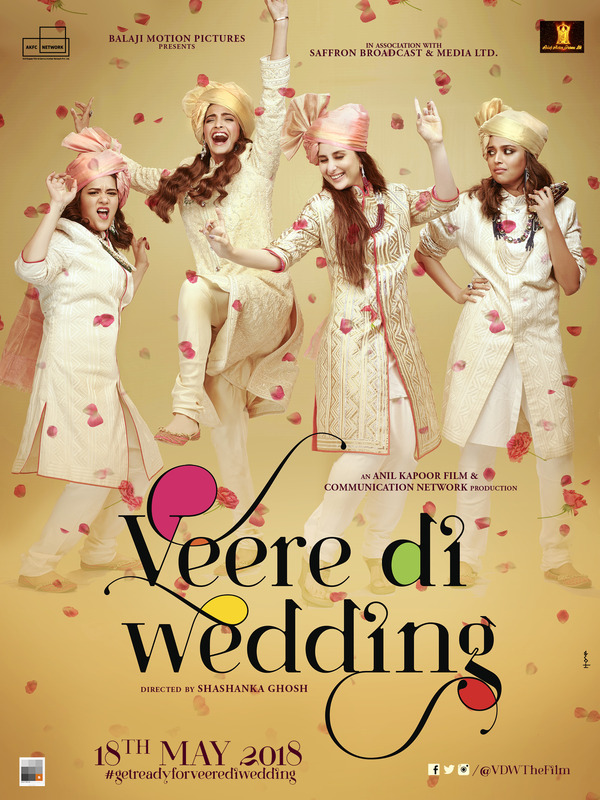 Veere Di Wedding is presented by Balaji Motion Pictures in association with Saffron Broadcast & Media Ltd., and An Anil Kapoor Film & Communication Network production.